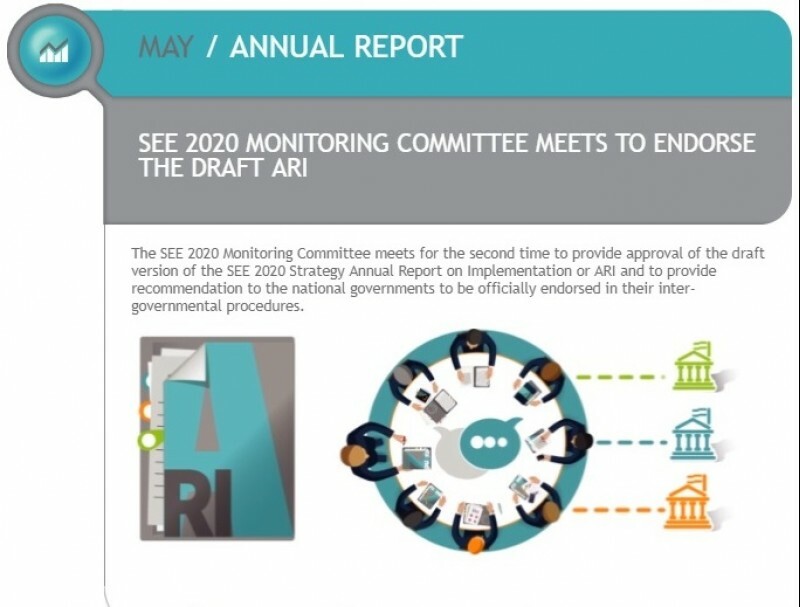 Podgorica - Monitoring Committee of the South East Europe 2020 (SEE 2020) Strategy met for the 6th time, under auspice of the Regional Cooperation Council (RCC), in Podgorica today, to discuss and provide comments on the Strategy’s early draft Annual Implementation Report (ARI). The meeting participants coming from regions’ economies involved in the implementation of SEE 2020 Strategy heard the presentation of the draft findings from the ARI for 2018 delivered by the RCC team, which was followed by discussion and comments. At this meeting the RCC sought feedback from the Monitoring Committee, and this process is meant to be finalised by beginning of July with its official adoption by the SEE 2020 Governing Board, thus completing this annual monitoring cycle and initiating the next one. The final Report will be subsequently presented to all participating economies and public in the region. ARI covers all activities undertaken in the implementation of the Strategy in the previous year, summing up the progress achieved, arising issues but also setting out some overall recommendations to adjust and strengthen the Strategy so it would address the changes brought by the dynamic political and economic environment in which it is implemented. At today's meeting SEE 2020 Monitoring Committee has also heard overview of the main elements of the latest Enlargement package and the assessments form the Economic Reform Programmes (ERPs) 2018-2020, as presented by representative of the European Commission's (EC) Directorate-General for European Neighbourhood Policy and Enlargement Negotiations (DG NEAR) and learned about developments in cooperation with the international organisations within the SEE 2020 monitoring process, such as SIGMA, Organisation for Economic Co-operation and Development (OECD), and European Training Foundation (ETF). SEE 2020 Monitoring Committee oversees the overall process of monitoring the Strategy's implementation and proposes any changes to optimize the process or modify the scope of monitoring. It consists of the appointed high-level officials at the level of Assistant Minister or State Secretary from the governments of South East Europe (Government representative) covered by SEE 2020 Strategy and a representative of the RCC Secretariat.